0.00 Begin at Saddle Junction, elevation 8075 feet (2460 m), head south on the rightmost trail. 0.38 Trail curves right 90°. 0.73 Cross minor drainage to east. 0.78 Cross drainage to east. 0.82 Cross minor drainage to east. 0.84 Trail bends 90° to right. 0.88 Trail bends gradually to left. 0.88 Cross drainage to east. 0.93 Trail bends to right. 0.99 Good view of ridge north of Red Tahquitz. Note pretty black (green if it has rained recently) moss in drainage ahead. 1.01 Cross drainage to east. 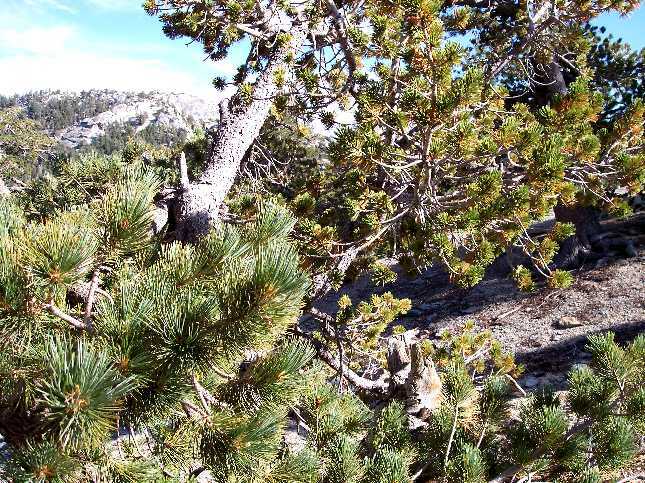 1.03 l Sugar pine, Pinus lambertiana, on left, growing next to limber pine, Pinus flexilis. 1.03 Cross minor drainage to east; view of little San Bernardino Mountains along drainage. 1.22 Trail curves right 90°; view of Salton Sea and Imperial Valley ahead left; view of Tahquitz Peak dead ahead. 2.78 Four-way trail jct. ; go left on Caramba Trail to Saddle Jct.